Multiplexing of multiple logical 802.1Q links over a single physical link. Logical link multiplexing might seem a solution in search of a problem until you discover that VMware-related design documents usually recommend using 6 to 10 NICs per server – an approach that either wastes switch ports or is hard to implement with blade servers’ mezzanine cards (due to limited number of backplane connections). Just got this question from one of my Service Provider friends: “If I am building a new MPLS backbone from scratch, should I design it with Carrier’s Carrier in mind?” Of course you should ... after all, the CsC functionality has almost no impact on the MPLS backbone (apart from introducing an extra label in the label stack). The article of the week is indubitably (how’s that for a Scrabble word?) RFC 6250, describing some of the stupidities (politely called misconceptions) TCP/IP stack had to deal with. Christoph Jaggi published a new revision of his excellent Ethernet Encryptor Market Overview documents: introduction, point-to-point and multipoint products. All you ever wanted to know about encryption (and much more). ... as some of its supporters seem to believe every now and then (I do get severe allergic reaction when someone claims it will change the laws of physics or when I’m faced with technical inaccuracies not to mention knee-jerking financial experts). Even more, assuming it can cross the adoption gap, it could fundamentally change the business models of networking vendors (maybe not in the way you’d like them to be changed). You can read more about my OpenFlow views in the article I wrote for SearchNetworking. On the more technological front, I still don’t expect to see miracles. Most OpenFlow-related ideas I’ve heard about have been tried (and failed) before. I fail to see why things would be different just because we use a different protocol to program the forwarding tables. In an amazing coincidence, Amazon launched IPv6-enabled Elastic Load Balancing just hours before my Enterprise IPv6 – the first steps webinar (you can still register for an online session) in which I describe (among other things) how you can make your IPv4-only content reachable over IPv6 with NAT64 or with 6-to-4 load balancing. This is an overly complex and unsupportable approach to shared services. Having to touch thousands of VRFs to create a shared services VPN is unacceptable. The correct approach is to touch only the "services" vrf, and import/export to each RT that you wish to insert the services into. As always, the right answer is “it depends.” If you have few large customers, it makes way more sense to add their RTs to the common services VRF. If you have many small customers, adding RTs to the common services VRF does not scale. When I was explaining stateless and stateful NAT64 a while ago, I compared them to what we used to know as NAT (L3-only translation) and PAT (per-L4-session translation). Wrong. Even L3-only NAT44 needs some state (inside-to-outside IPv4 address mapping). Stateless NAT64 is truly stateless: it uses a deterministic algorithm to convert IPv4 addresses into specially crafted IPv6 addresses (a good diagram is included in IOS XE documentation). It’s also mostly useless. I guess we all heard the fundamentalist IPv6 mantra by now: “Every subnet gets a /64.” Being a good foot soldier, I included it in my Enterprise IPv6 webinar (last live session in 1H2011 in a few days – register here). Time to fix that slide and admit what we also knew for a long time: IPv6 is classless and we have yet to see the mysterious device that dies in flames when sniffing a prefix longer than a /64. Jeroen sent me an interesting challenge: he would like to reload the router when the 3G WAN interface gets stuck (I thought my Nokia phone is the only one exhibiting this problem, but obviously I was wrong). The reload-on-failed-ping EEM applet I’ve published would be a perfect solution, but it uses track delay and the maximum delay timeout is three minutes, while Jeroen would like to wait 15 minutes before reloading the router. The Common Services MPLS/VPN topology is the topology in which multiple customers access the same common servers without being able to access each other’s networks. You can implement this requirement with judicious use of inter-VRF NAT or with controlled route leaking between customers’ and common services VRFs (assuming the customers don’t use overlapping address space). I got totally fed up with the currently popular “flat-earth with long-distance bridging” architecture paradigm while developing the Data Center Interconnects webinar. It all started with the layer-2 hypervisor switches and lack of decent L3 network-side solutions; promoting non-scalable cloudy solutions doesn’t help either. The network infrastructure would scale better if the hypervisors would work as MPLS/VPN PE-routers, but even MPLS would hit scalability limits when the number of servers grows into tens of thousands. The only truly scalable solution is IP-over-IP or MAC-over-IP implemented in the hypervisor switches. I tried to organize all these thoughts in the “How to build a scalable IaaS cloud network infrastructure” article that was recently published by SearchTelecom ... and just a few days after the article was published, Brad Hedlund pointed me to Infrastructure as a Service Builder’s Guide document, which is saying almost the same thing (and coming to flawed conclusions because they had to promote OpenFlow and NEC). Brandon Carroll has recently launched MyIPv6Tutor.com, an e-learning program targeted at engineers that want to learn IPv6 basics at their own pace. I know Brandon is an excellent instructor, so there are at least four IPv6 training options I can wholeheartedly recommend. If you need a high-level overview and an action plan, my Enterprise IPv6 – the first steps webinar is the right choice (register for an online session or buy a recording). HP’s FlexNetwork architecture launch at Interop has received mixed responses: from pretty positive from Tom the Networking Nerd to cautiously optimistic from Greg (Etherealmind) Ferro and more cautious analysis by Shamus McGillicuddy. For a grumpy skeptic’s take, read my FastPacket blog post. Once we have a scalable solution that will be able to stand on its own in a large data center, most smart network admins will be more than happy to get away from provisioning VLANs and focus on other problems. After all, most companies have other networking problems beyond data center switching. As for disappearing work, we've seen the demise of DECnet, IPX, SNA, DLSw and multi-protocol networks (which are coming back with IPv6) without our jobs getting any simpler, so I'm not worried about the jobless network admin. I am worried, however, about the stability of the networks we are building, and that’s the only reason I’m ranting about the emerging flat-earth architectures. If I pay the $199.00 does that mean I have access to ALL of your webinars? Absolutely, all sixteen of them (with new ones being added every two or three months). And don’t forget you also get unlimited access to all live webinars. Solution#1 (painful): Configure all possible VLANs on the trunk link. Stretched VLANs spanning the whole data center are an ideal ingredient of a major meltdown. 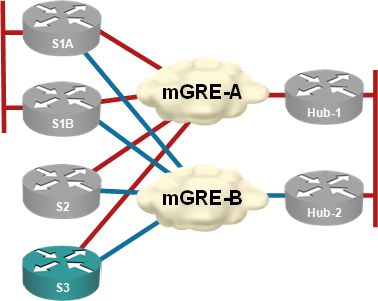 OSPF and connected networks: to redistribute or not? A few days ago I was discussing a data center design with a seasoned network architect and during the MPLS discussions he made an offhand remark “there are still some switches running OSPF and using network 0.0.0.0 and redistribute connected.” My first thought was “this can’t be good” but I had no idea how bad it is until I ran a lab test. The generic dilemma along the lines of “should I make connected interfaces part of my OSPF process (and make them passive) or should I redistribute them into OSPF” has no clear-cut answer (apart from the obvious “it depends”) ... and Google will quickly find you tons of lengthy discussions. Summary for differently attentive: A hub router failure in multi-hub DMVPN networks can cause spoke-to-spoke traffic disruptions that last up to three minutes. Almost every DMVPN design I’ve seen has multiple hubs for redundancy purposes. I’ve always preached the “one hub per DMVPN tunnel” mantra (see the diagram below) to those who were willing to listen citing “NHRP issues after hub failure” as one of the main reasons you should not have two or more hubs per DMVPN tunnel.